I've definitely noticed all the ruffly things lately! Some of the handmade ones I've seen are really awesome! Ooooh I do love a ruffle here and there. Love that first picture of the layered top with flower. love all the ruffles! did some ruffles with zippers on a top recently and also refashioned a tee into a ruffley top! too much fun! Great round-up of tutorials!! I just got a sewing machine yesterday and I am hoping to find an easy first project! So cool! I'm going to transform some of my shirts at home this weekend! Thank you for the tutorials. I had purchased some plain t-shirts recently with this intent - but wasn't sure "how" - I can't wait to get started! Thank you for posting! I love the texture given by ruffles. 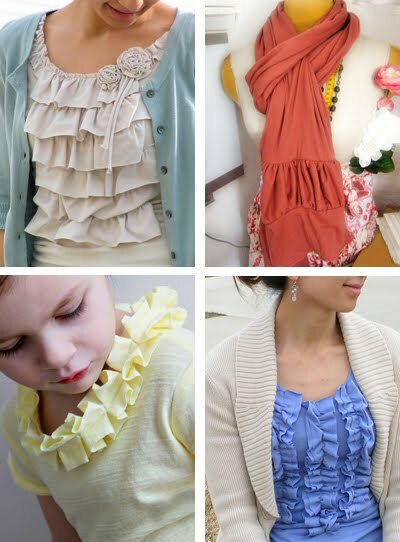 Great ruffle projects - I really love the layered ruffles! Great round up. I love all of these! Ruffles are so popular right now, thank you for including me, I'm a long time fan of your blog! Oh my goodness; that pillowcase dress is adorable! Bookmarked! Yeah, I'm really going to need to learn how to sew now. Thanks very much for the great tutorial list - much appreciated. As usual, spot on eye. Great projects. Thanks for the inspiration. Oh you are a gem. Thanks for posting all of these wonderful links. I've been wanting to do a "ruffly" something or other and voilà yo have provided the resources. I do love me some ruffles. They are so pretty and feminine and well, as you said very in at the moment. Cheers! Wunderful Links. thanks for collecting. Some old shirt in my closet will alive again with some ruffles! Ha! I'm so showing this post to my husband! He teases me anytime I wear something with a ruffle, and asks me if I'm sure they're actually in style. Also, more incentive to add more of them to my wardrobe! Okay, so I'm going to be totally tacky and make a shameless plug for my own blog, but at least it's on topic. I've recently been really into ruffles! Thanks for posting this! The blog rufflesandstuff has lots of great stuff on it! Wow ... I LOVE THIS POST!! thank you so much. I can't wait to make some of these. It's awesome having all the great ideas in one easy to find place! thanks i can't wait to make me some ruffles! Jess, I love these tutorial collections so much. You just seem to be on the same wavelength as me when it comes to design. I get so excited when I see a post form you in my RSS feeds. Thanks so much. Super! I added it to the list.